With so much Ancient Roman treasure found around Britain, Europe, and North Africa, it's sometimes easy to forget that archaeologists are still finding Roman artifacts within the confines of the empire's origin, the Italian peninsula. 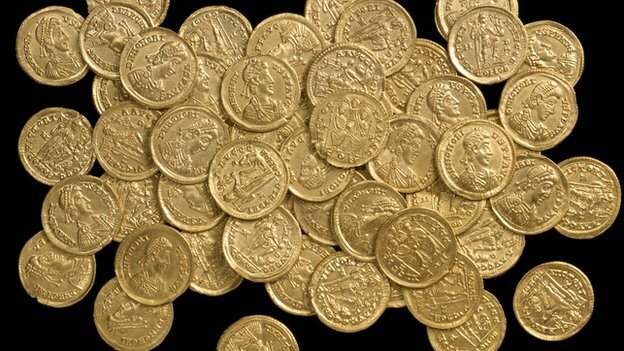 Believe it or not, a hoard of hundreds of gold coins from the Late Roman Empire were just found in Italy, left untouched for about 1,500 years. A great deal of historical information can be gleaned from archaeological discoveries that include coins. It's generally taken as the surest sign of commercial activity or the location of an ancient marketplace. Naturally, the presence of coins can also provide an approximate indication of an ancient household's or estate's relative wealth. Generally speaking, a single standard gold coin had enough purchasing power to buy a mature, healthy horse during antiquity. In other words, it represented quite a bit of money. Whoever hid this hoard of coins for safekeeping or later retrieval was considerably wealthy, but probably well short of being an elite member of Roman society. This group of coins was discovered underneath the remains of an old theater known as Teatro Cressoni, per reports from CNN. There were at least 300 gold coins in all, and they were found inside an amphora, a large Greco-Roman style jar, made of soapstone. All of the coins date to the Roman imperial era during the fifth century C.E., near the time that the western portion of the empire fell. By about the midpoint of the fifth century, the true power center of the empire had already shifted to the east, centered on the capital of Constantinople on the peninsula known as Anatolia (modern-day Istanbul in Turkey). This is where the "Eastern Roman Empire"—more commonly referred to as the Byzantine Empire by historians—would continue to operate for the next thousand years. Given the age of the coins, they are in an incredibly good state of preservation. This supports the notion that nobody has disturbed or touched this gold since it was placed there during antiquity some 15 centuries ago. It's also somewhat surprising that coins approximately dating to the fall of Rome would have been ignored, forgotten, or entirely missed by the invading Vandals, Goths, and Visigoths who eventually wrested control of the Italian peninsula in the latter half of the century. More details about the find are still scant, as the first news reports about the discovery began to appear last week. You can also find news articles about these 300 gold coins in the local Italian-language press.